Mud and debris flows blocked intersections and forced road closures in parts of a Southern California foothill neighborhood under a mandatory evacuation as a strong winter storm slammed the region. Mandatory evacuations have been issued for the foothills community of Monrovia as a strong storm brought flooding concerns to the area. About 50 to 60 homes were being affected by the evacuations near the Madison fire burn area. Residents were advised to gather their belongings and leave the area. An evacuation shelter was set up at the Monrovia Community Center located at 119 West Palm Avenue. Evacuated pets can be taken to the Pasadena Humane Society located at 361 S. Raymond Ave. free of charge. Significant flooding was closing eastbound traffic on Sierra Madre Avenue near the mudflow between McNeil Drive and Barranca Avenue, according to the Azusa Police Department. 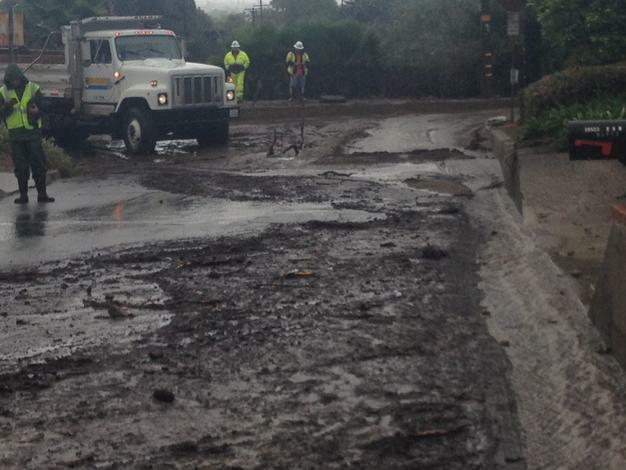 Mudflow onto residential properties also was reported in Azusa. A tractor could be seen on the affected street scooping up water and mud from the flooding. Flash flood warnings were in effect Friday as weather officials braced for periods of heavy rains and possible thunderstorms through Saturday night. Mail delivery was suspended in the evacuated area, but residents are able to pick up mail at Glendora and Azusa Post Offices during normal business hours with valid photo identification.